In June this year, a Lords Select Committee on Citizenship and Civic Engagement was appointed. Submissions of written evidence were invited, and of course, this being very much our area, we felt the need to contribute. Our written evidence is a fairly quick read . Nonetheless we hope that it gets the essential points across, drawing on our experience in what works and what doesn’t in technology for civic engagement. You can view all the submissions the inquiry received on the Parliament website. The committee will report their findings by the end of March next year. In case you hadn’t heard, yesterday Parliament debated whether Donald Trump should be barred entry to the UK. This is a bit of an occasion, because the first petition has been signed by more people than any other in this Parliament. It has 573,971 signatures, and its title is “Block Donald J Trump from UK entry”. The second petition is titled “Don’t ban Trump from the United Kingdom”. That petition is curious. It has 42,898 signatures, but 30,000 signatures were removed because they were thought to be suspect and coming from one source. 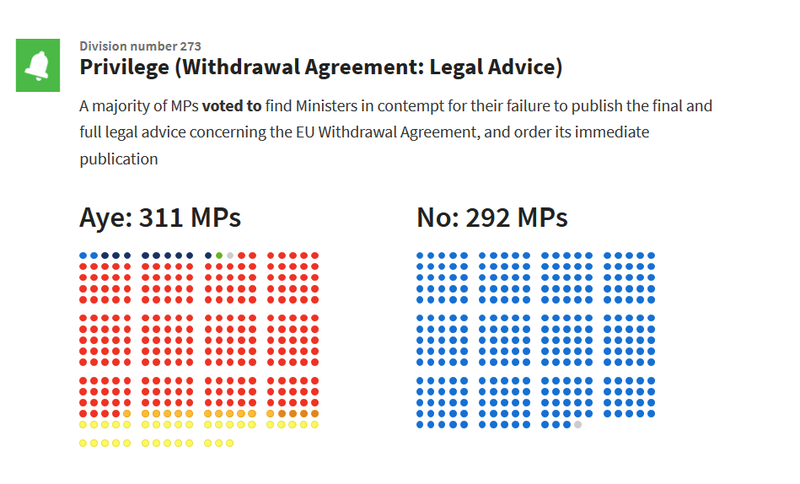 Now, regular TheyWorkForYou readers know that parliamentary debates are often interesting, sometimes thought-provoking, and occasionally amusing. The Trump debate is a great example of all of those things. But most people see the goings-on in Parliament as very dull. Today, you might want to do someone a favour, and point them towards this particular debate, which you can see in full here. As always with TheyWorkForYou content, it’s easy to search, share or link to any individual section. And as if that’s not enough, this debate contains the only use of the word wazzock yet recorded in Parliament. Now that’s got to be worth a share. Why we do what we do. No, not the name of a wonderfully named new mySociety product, instead it’s an excuse for me to take stock of where we are and where we go next. Inevitably over the past decade we’ve tackled lots of issues and projects from lots of different angles. What we’re currently focused on is Freedom of Information, Parliaments and Elections, and Local Issue Reporting. Lack of access to elected representatives amongst disadvantaged or underrepresented groups is a key driver of exclusion and inequality, yet governments tend only to become better at serving the needs of citizens when those citizens are capable of demanding better. Simply put, this is our cause. Citizens will only demand better from governments if they have access to a mix of often scarce resources: from education, to wealth, to knowledge about government failings. At mySociety we are highly aware that we can’t give people most of these things: we can’t boost business in failing economies or bring teachers into schools that have none. These are the tasks of development funders, political leaders and well-regulated markets. Tremendous human suffering happens when governments fail to serve the needs of their citizens, and human welfare is dramatically increased when governments serve citizens’ needs well. Some governments are excellent at meeting some citizen needs, but weak at meeting others, harming a minority, often invisibly. Others make no attempt to meet any of their citizens’ needs, robbing, starving and failing them in every possible way. Our theory of change is based on a reading of political history, and specifically of the history of reform campaigns, such as those that drove the democratisation of nations from the 17th to the 20th century. We believe that governments tend only to get better at serving the needs of citizens when citizens are capable of demanding better, creating a virtuous circle that leads steadily to better government. Each of our services give citizens the skills, confidence and knowledge they need in order to be capable of demanding better. FOI is a core plank of a healthy, transparent and accountable democracy. Every citizen should have the right to query and understand the workings of government and public bodies on their own terms. Alaveteli is our platform for FOI request websites. We currently support partners in over 20 countries, from Australia to Hungary, Nicaragua to Ukraine, as well as a pan-European site AskTheEU. 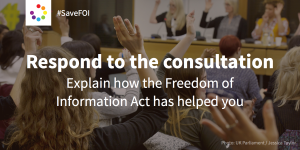 Our most successful site is WhatDoTheyKnow in the UK, with almost 300,000 individual FOI requests alone – drawn from over 16,000 UK public bodies. Over the next year we will continue to refine and develop Alaveteli to better support the expansion and proper use of FOI around the world. 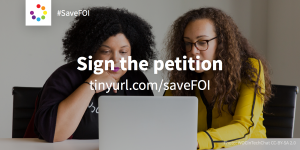 At the same time, we’ll be actively campaigning to preserve FOI in the UK which is currently under threat from the Government’s FOI commission. The activities of Government can often be opaque and difficult to interpret. We improve access to elected representatives, providing clarity, context and understanding to the decisions they make on our behalf. We tackle the workings of government at a variety of points throughout the electoral cycle; YourNextMP/Rep for candidate information, TheyWorkForYou and WriteToThem allow people to query and explain the workings of government at all levels. Increasingly central to these efforts is EveryPolitician, our crowdsourcing effort to sustainably store and share a structured open data set of every national politician around the world. It currently holds data on more than 60,000 politicians from over 230 territories. In the next few weeks we’ll complete work to integrate all of our existing Parliament services with EveryPolitician and continue to encourage more journalists, developers, and NGOs to create the tools they need in their own countries. FixMyStreet gets right to the root of any disconnect between citizens and those who provide their local services. Literally dealing with street-level issues, FixMyStreet can help turn our everyday feelings of frustration into action. The original and much emulated FixMyStreet.com makes it easy to report street faults like broken street lights or potholes, raising over 650,000 reports in the last 8 years. We’ve extended the principle of issue – reporting – resolution, to create a generalised platform catering to a variety of interesting and practical new use cases; with projects as varied as empty home identification, or logging road collisions and near misses for cyclists. Citizens feel more in control. Local councils can target their efforts more effectively. Together this can contribute to better government. For the moment we’ll continue to consolidate our offer in these three areas. There’s ample scope for further development, refinement of concepts and of course directly increasing the impact of currently deployed sites. What gets really interesting is when we start to scale up the delivery of each of these in more countries, delivered to more people, ensuring we see more citizens gain greater influence over those with power. I’ll post again later this week about some of the practical changes that we are making to better encourage the take up of our services and how we’re improving the way we work with our partners. Note: Not only were these changes outruled, but WhatDoTheyKnow got a nice mention in the process. See more in our follow-up blog post. Proposed changes, currently under discussion by a cross-party government commission, could make it much harder for you to access information. The newspapers that you read would be less able to uncover stories of corruption, malpractice or cover-ups. You have until 20 November if you’d like to voice your opposition to these restraints. Here are four easy ways you can take action right now—you’ll find more details about all of them on the Campaign For Freedom of Information’s website. 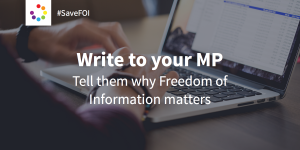 Use WriteToThem.com to tell your MP why Freedom of Information is important and how restrictions would affect you, or society as a whole. Stuck for words? Here are some ideas. The call for evidence is here and there is further guidance on the Campaign For Freedom of Information’s website. 38 Degrees have also put together this super-easy Plain English version. If you charge for making a Freedom of Information request, you automatically exclude a sector of society from the right to know. It’s not just that a limited income will discourage some people from making requests (though it will, and our research has already shown that engaging with our democratic system is largely the preserve of the well-educated and well-off, a situation which needs to be rectified). It’s also that the added complexity will discourage those who already consider the FOI process daunting—something we’ve always striven hard to overcome with WhatDoTheyKnow.com. The right to information should be available to everyone. Not just those with money to spare, and the bureaucratic skills to navigate its complexities. Our Alaveteli software helps people run FOI sites all over the world. At our recent conference, we heard of the struggles those people face, from the charging of fees, to bodies’ refusal to release information, to complex red tape. In every case, the result was impeded access to information, a lowering of public’s engagement with their right to know, and increased disenfranchisement. In Ireland, for example, where similar constraints were put in place in 2003, overall usage of the FOI Act fell by over 50%, and requests by the media by over 83%*. Note that many important UK news stories in recent times have come from FOI requests: the imposition of fees and restrictions will have a stifling effect on journalists. The current consultation threatens to put the UK in the same boat. Running WhatDoTheyKnow, we’re already aware that many requests are turned down—requests which we’d consider quite reasonable. If these new restrictions take hold, it will be much easier for ministers to use the power of veto to withhold any information they choose. The “safe space” argument as in the Commission’s call for evidence stresses the importance of collective cabinet responsibility and not revealing private splits within the cabinet. We believe that such splits are in fact vital for the public to know about, in the interests of democracy. We’d also say it’s likely, human nature being what it is, that should a veto be made available, information will also be withheld when it is inconvenient or detrimental to the ministers’ party line. If you pay someone to do a job, you’re within your rights to examine their work when you need to. We should never forget that public authorities—the bodies which are subject to the FOI Act—are funded by us, the taxpayer. We should have the right to hold them to account. 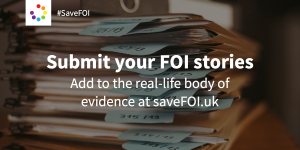 If the government is concerned about the costs of FOI, instead of imposing restrictions, it should promote more proactive disclosure of information held by public bodies, which would save everyone time and money. These are just a few of the reasons we’ll be asking you to take action over the next ten days. Please do all you can—and then help spread the word. *A Review of the Operation of the Freedom of Information (Amendment) Act 2003: An Investigation into the Effects of the Amendment Act and the Introduction of Fees on Access Requests by Members of the Public. Ireland later reversed the decision to introduce fees “to restore the balance”.